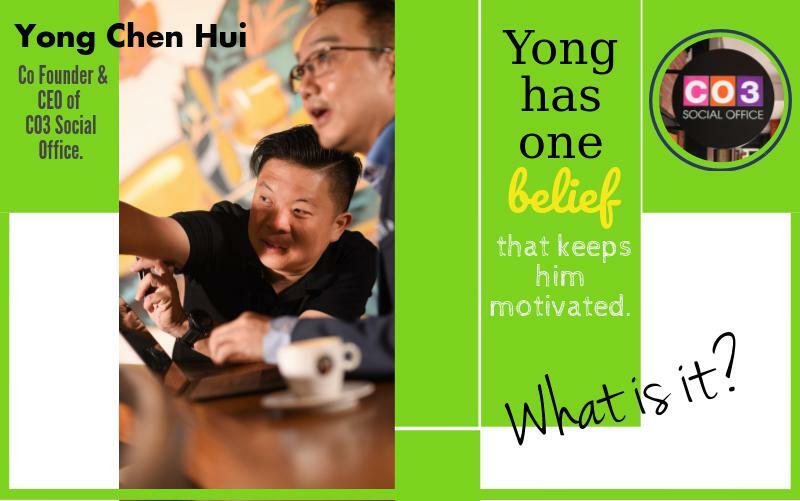 ThamCheeWah | Yong, Co-founder and CEO of CO3 Social Office, has one belief that keeps him motivated, what is it? “I truly believe that people are honest,” Mr Yong Chen Hui, co-founder and CEO of CO3 Social Office, said with determination. He believes that as human beings, we have innate qualities which need space to culminate. Being honest is one of those qualities. He calls it the ‘Context Creation”. In CO3 Social Office, Malaysia's leading co-working space, everyone who uses the office space, regardless whether you are a visitor or one of the office users, you pay for what you consume. At the bar counter, food items such as snacks, pastry and beverages which include coffee, tea and alcoholic drinks are available for sale. There is a price list of each item but there is no cash register. There is no one who manages a till. After you have selected the food or drink you want, you just need to drop the money into a glass container. If you need change, take your change from the same glass container. “When I told my friends about this system of pay-as-you-eat, they cautioned me of people being dishonest. They said this system only applies in other countries, but not here,” Yong laughed it off. Let’s look at the religious places like churches, temples and mosques, when we walk into these sacred places, without even being told, we automatically keep quiet. Even when we speak with each other, we whisper. “This is what I mean by ‘Context Creation’. Somehow, these religious places evoke an energy of serenity. We instinctively lower our voices and begin to respect the tranquility.” So, in CO3, it is a space where honesty reigns. Yong reiterated that people need a space to return to being honest. If we don’t start, we will not be able to realize that we are honest after all. So far, it has worked pretty well in CO3. People pay as they pick up their food items. And pick up their change when needed. “I blame no one. I just keep moving.” Even though many people rejected the idea to create an ‘Honor Corner’, he persevered. Just like losing his wallpaper business in 2015, Yong is positive about the idea of honesty as strong as he believed he can revive the company. The Korea Wallpaper galleries were destroyed due to fire, not once but twice. And it happened one after another within just three weeks. Yong is also the owner of Korea Wallpaper, the leading wallpaper brand in Malaysia, whose office in JB was destroyed in fire. Three weeks later, their outlet in KL suffered the same devastating fate. Making matters worse, it was nearing the supposedly best sales month - during the month of ramadan where prospects are sprucing up their properties for Hari Raya. Hence the ‘Honor Corner’. It is a system. It is about influencing - one person at a time. Even as tedious as going one-on-one to show them that honesty works, good human spirit never fails. When someone sees that this is good, another will follow. Then, eventually it becomes a norm. It becomes a culture. Is there enforcement, certain policies or is there a signboard to teach honesty in CO3? “No. Not even CCTV. You just need to believe - that people are honest.” Yong chuckled. All you need is this one thought to move mountains, what is it? - Mr Alred Yow, Managing Director of A & A Chesterfield, the Largest Chesterfield Furniture Manufacturer recognised by the Malaysia Book of Records. Read more.